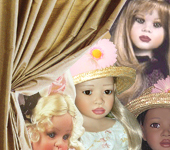 Welcome to The Doll Empire! 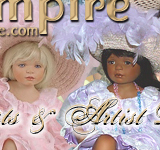 The Doll Empire presents The Glamorous World Of Doll Artists & Artist Dolls. 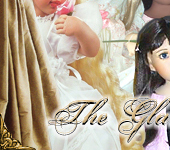 The Doll Empire is an informative site about doll artists and their artist dolls creations with high quality graphics of porcelain artist dolls bisque artist dolls resin artist dolls vinyl artist dolls silicone artist dolls wax artist dolls including one of a kind OOAK studio artist dolls limited edition artist dolls artist edition dolls porcelain bisque resin silicone wax vinyl. Famous Rustie's Unique Designs Rustie one of a kind artist original studio porcelain artist dolls, limited edition production dolls by Rustie; Jan McLean Designs porcelain and vinyl artist dolls by New Zealand doll artist Jan McLean including Lollipops, Beau Belle Collection, French Floozy Bourgeoisie Collection, Vinyl Collection, 3 Friends Collection, Essence Collection, amazing porcelain and vinyl dolls; the glamorous Mary Benner Cherished Collectibles artist original Victorian lady porcelain dolls and antique repro porcelain dolls, María José Santos Fernández Spanish doll artist creator of miniature porcelain dolls of ladies of different historical periods, characters of famous ballets and popular fairy tales; The Doll Empire Fayzah Spanos Fan Site dedicated to Greek American doll artist Fayzah Spanos creator of porcelain and vinyl studio artist dolls Precious Heirloom Dolls; Patricia Rose dolls, angels, fairies, ladies, The Doll Empire Christine Orange Fan Site dedicated to British doll artist Christine Heath Orange sculptor and creator of child-like limited edition porcelain dolls. 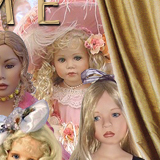 The Doll Empire Donna Rubert Fan Site dedicated to American Doll Artist Donna Rubert Donna Rubert American doll artist is creator, sculptor and designer of contemporary artist dolls made in porcelain and in vinyl. The Doll Maker Linda Rick American doll artist creator of porcelain and vinyl artist dolls including angel doll, bride dolls, pretty fancy dolls, country dolls, fun character dolls, artist teddy bears, Precious Moments dolls, Lovee vinyl dolls, Doll Maker and Friends collaborative artistry with other well known master doll artists including Rosemarie Strydom, Beverly Stoehr, Bonnie Chyle, Joann Pohlman, Diane Bucki, Melissa McCrory, Tawny Nix, Pat Moulten. Pamela Mason American doll artist, designer of Petite Poupee Dolls made of fine European clay; Italian doll artist Mariarita Brunazzi creator of one of a kind Italian clay dolls, handmade collector's porcelain artist dolls by the famous German doll artist Heidi Plusczok, information about Thomas Baecker Puppenmanufaktur German doll artist including doll artists Angela McNeely, Ashley Thitima, Damrie Benninghoven, Ineke Pepperkamp for the Angel's Paradise Doll Collection, Ruby Doll Collection and Queens Gallery Doll Collection. Native American doll artist costume designer Denise McMillan, American doll artist Donna Rubert sculptor and designer of highly collectable artist dolls; American doll artist Peggy Dey creator of artist edition vinyl dolls, Monika Peter-Leicht German doll artist creator of vinyl boy dolls and vinyl girl dolls; Monika Levenig German doll artist creator of vinyl boy dolls and vinyl girl dolls. 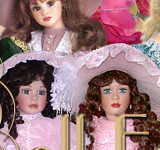 American doll artist Janis Berard creator of marvelous gowns and beautiful Victorian ladies full-body porcelain dolls. Doll dolls artist dolls doll artists porcelain dolls porcelain artist dolls vinyl dolls vinyl artist dolls silicone dolls silicone artist dolls one of a kind dolls one of a kind artist dolls one of a kind porcelain dolls OOAK dolls OOAK artist dolls limited edition dolls limited edition artist dolls production dolls artist originals artist original dolls artist edition dolls studio dolls contemporary dolls play dolls fashion dolls lady dolls Victorian dolls collectible dolls craftsmanship sculpt doll designers doll manufacturers. *Note: The Doll Empire Web Site is created, owned and copyrighted © by The Doll Empire (http://www.TheDollEmpire.com), all rights reserved. This web site and any material, graphics, images contained herein shall not be taken, reproduced or modified by whole or part in any form whatsoever. Created December, 2000. 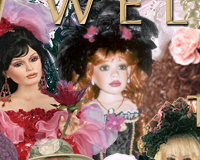 The doll pictures are viewed best with high bandwidth internet connection. Please wait for the pictures to download, as they are large image files.